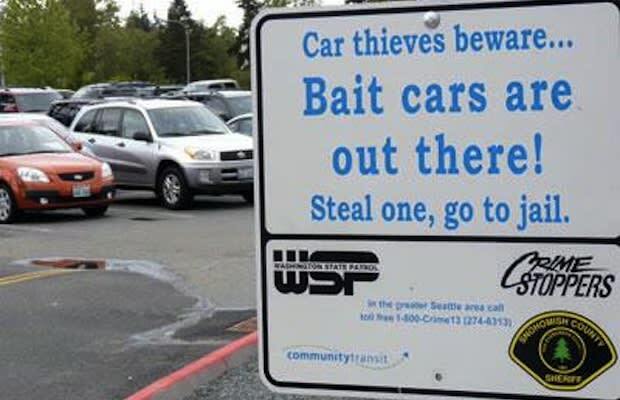 Four Thieves Actually Stole The Bait Car From "Bait Car"
Clearly, they did not see any signs like this one. The show Bait Car on TruTV secretly films criminals, through a hidden camera, who are trying to steal a specific car planted anywhere in the city of Los Angeles. Normally, when triggered, it traps the thief in the car until LAPD can arrive to arrest them. Earlier last month, however, it did not do this, and four dudes were able to get away with stealing the car from La Brea Avenue in Los Angeles. Two of the guys were arrested the same day the car was stolen, and one was arrested this month after cops were tipped off by a photo labeling him to be a probationer who hung out in the Hollywood area a lot. The cops wouldn&apos;t describe the car that was stolen because they don&apos;t want to tip off future thieves, but that won&apos;t even matter unless they make sure that the car&apos;s mechanisms actually work next time.